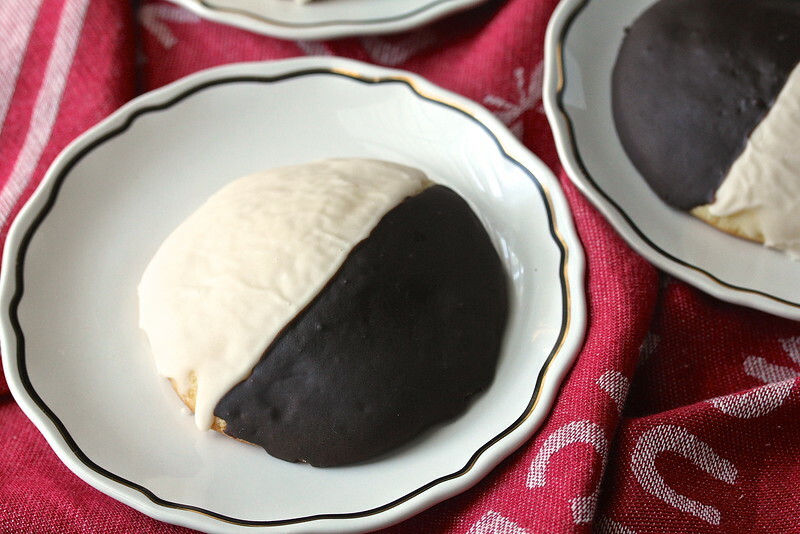 Black and White Cookies consist of a four inch diameter cake-like vanilla cookie thinly glazed with vanilla and chocolate icing. Evidently, the question, "Who makes the best Black and White Cookie?" is hotly debated in New York, both throughout the state and all five boroughs of the city. 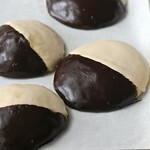 Not being from New York, I did a little "research" on the interwebs, and came across lots of lively discussions about where to find the best Black and White Cookie. This month, the Creative Cookie Exchange bakers are baking decorated cookies. I didn't want to get too ambitious after the decorated Easter egg cookie with royal icing debacle, and while sprinkles are a natural for me (they hide everything! ), I decided I needed to try something different. I'm a big fan of Matt Lewis and Renato Poliafito, the authors of the Baked series of cookbooks, as well as owners of two Baked locations in NYC. so I turned to their book, Baked Explorations: Classic American Desserts Reinvented, which is where I found out about Black and White Cookies (by the way, they have four books, all of which I own. I recommend their newest, Baked Occasions for giving this holiday season. The cover will make your recipients smile happily). These cookies are really tender little cakes flavored with vanilla and a hint of lemon zest. The glaze is is spread in a thin layer on each half of the cookie. They are really tasty, and they were a big hit with my grandkids. While they are large, you can easily cut them in half. And as Jerry Seinfeld says, you should eat a little chocolate and vanilla in each bite. What I didn't realize until it was too late is that the glaze is supposed to go on the FLAT side of the cookie! In other words, they should be glazed upside down. Doh! Oh well. This just means I'll have to make them again. After the recipe, be sure to check out the rest of the decorated cookies from the Creative Cookie Exchange. Whisk the flour, baking powder, baking soda, and salt together in a large bowl. In a large bowl, mix the butter and sugar with an electric mixer (stand or hand held) until fluffy, about two minutes. Add the eggs, one at a time, mixing between each addition. Scrape down the sides and bottom of the bowl. Add the flour in three steps, alternating with the buttermilk, added in two steps, mixing until just blended. Scrape down the sides of the bowl. Mix in the vanilla and lemon zest. Line baking sheets with parchment paper, and using a 1/4 cup ice cream scoop, scoop the batter onto the pans, allowing about three inches between each cookie. You should get no more than six cookies per half sheet pan. Bake the cookies, one sheet at a time, for 17 minutes. The edges should be slightly golden, and the center should spring back when slightly touched. Cool the cookies on the pan on a rack for five minutes, and then remove from the pan and cool on a rack completely. To make the icing, mix the sugar, milk, cream, and vanilla. The icing should be spreadable, but thin enough to not look like cake frosting. Spread the vanilla frosting over half of the flat side of the cookie with an offset spatula. Let the frosting set for about 20 minutes. Add the chocolate to the rest of the icing and whisk. Add water, by the teaspoon, until you get a similar consistency to the vanilla icing. Spread the chocolate icing over the other half of the cookie. Let the icing set or at least an hour. These cookies are best served within 24 hours, but will keep for up to three days if kept in an airtight container at room temperature. These are my favorite cookies. And they don't last 24 hours in my home :)) And to me everyone makes the best black and white cookies. Can you tell I am NOT a New Yorker and that I really do love these cookies. Totally not a New Yorker!! I am a big fan of the BAKED books too. Must try these cookies. They look and sound delicious! Thanks! Aren't those books great? My only complaint is they only measure by volume. Oh, this is one of my favorite cookies! I haven't tried making them myself yet but I just might give it a try with your recipe. And I would have been saying duh too with icing them upside down. I don't really think it matters, they're always delish! Thanks for the affirmation Linda! When in doubt, go with a classic! Great choice! Who glazes the bottom of a cookie?! I'd have made them exactly as you did, Karen. For those of us who don't know any better, they are perfect! And the taste is what matters anyhow. Thank you! I like your way of thinking! I have a few of the cookbooks you mentioned and will have to get out Baked Occasions this weekend for inspiration and recipes. This is my favorite time of year to bake! 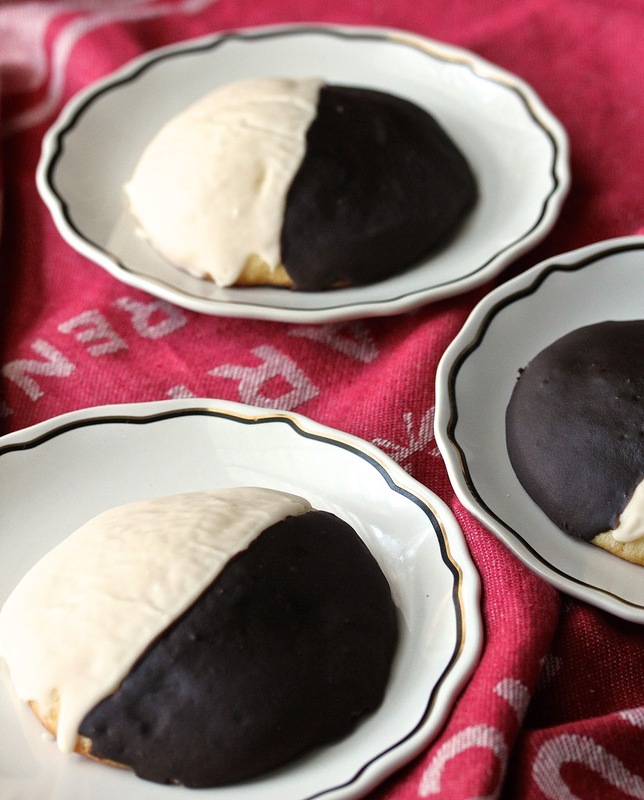 I've never had the pleasure of an authentic black and white cookie, but I must say that yours look delicious and look like ones I've heard about. Pretty sure I would have iced them on that side too, but thanks for the heads-up. I own all four of the Baked cookbooks too and I really must get them out and make a few things soon, including these cookies. You can come any time!! We'll have to make both for "scientific" purposes. Thanks so much Laura! Ha ha!! I'm so glad you liked them!! And especially your kids! !